2010 Peppered Thought Christmas Wishlist is Here! I know you all were absolutely dying to know what eccentric and elaborate things I had on my wishlist this year…well wait no more! Clockwise from top left: Arrow ring, $30 – so simple and pretty; placemat fabric, $18 for 6 settings – I feel like there’s a bunch of craft possibilities with them! 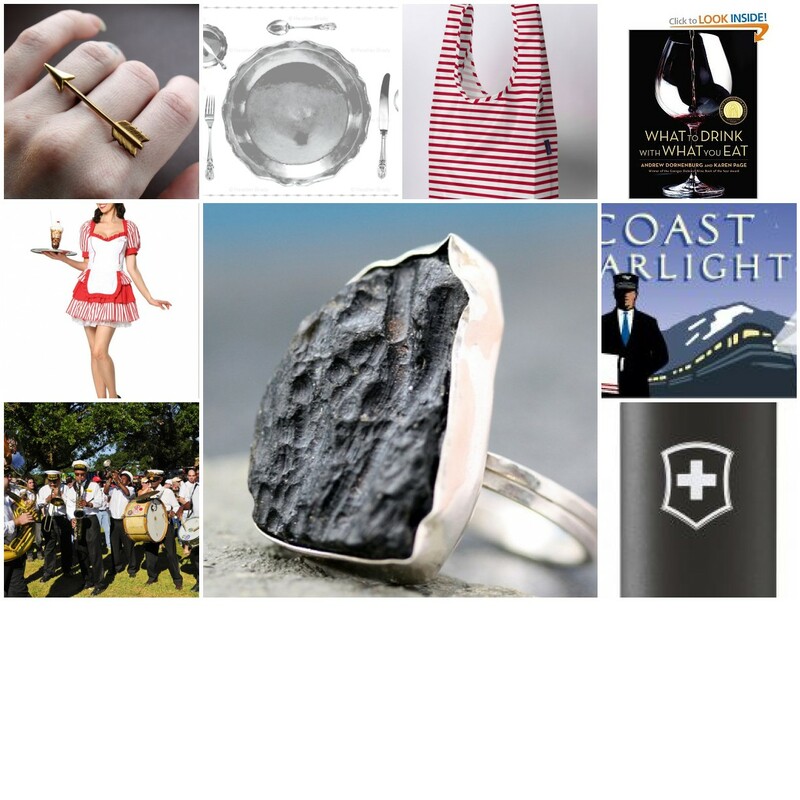 ; red stripe Baggu bag, $8; What to Drink book, $23 – being the boozy little epicurean I am; Coast Starlight Amtrak train ride, $prices vary on length of travel; Sigg water bottle black matte with cross, $25; meteorite ring, $90 – yes, a ring made from tektite, the space nerd in me meets the girly girl; New Orleans Treme Band playing Voodoo Festival, $200 depending on how many days and travel situations; Diner costume,$ 45 – I know the costume might seem random, but I think it would be fun to wear when I go to the soda fountain and diners! I also have a gift guide from last year, which includes a great link to a checklist and gift guide template, and even some of my famous list pictures!